Bright and surrounding villages are defined by the rivers and creeks that run through them. The Ovens and Buckland Rivers carve a path amidst our valleys providing tranquil spaces to embrace our alpine environment and immerse in our pure waters. very lifestyle. With the pristine Ovens River, Buckland River and Morses Creek nearby - Join us in the rivers and retreat from the summer’s heat. Skim stones in our natural pools and feast on the fish it provides. Fossick for hidden treasures, plunge into swimming nooks and spot local wildlife, platypus, fish, frogs and turtles. Dotted with picnic facilities and walking tracks come and soak up the tranquillity. Along the valley floor and on our alpine peaks our lakes provide space for relaxation and activities. From Lake Catani on the graceful Mount Buffalo to Lake Buffalo on the valley flat. Take time out and rejuvenate in our waters. For the fishing enthusiasts the local Morses Creek; Ovens and Buckland Rivers and their tributaries, provide ample opportunity to unwind and try your hand at fishing. If your new to fishing you are assured a catch at the Harrietville Trout and Salmon farm or learn from the professionals and go with a local tour guide. 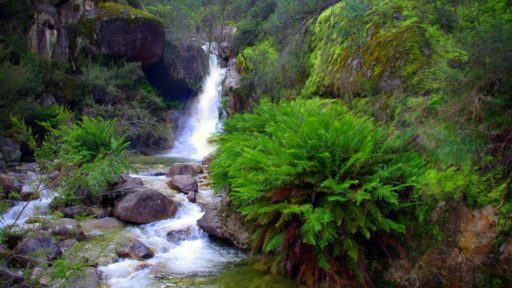 Nearby Mount Buffalo National Park offers some spectacular waterfalls for you to enjoy. Take a short stroll into Lady Bath Falls and Eurobin Falls or a longer walk to Rollasons Falls and Dicksons Falls. A little further afield but definately worth the drive is Fainter Falls, located on the Bogong High Plains Road between Mount Beauty and Falls Creek. Steeped with a rich gold history, the Ovens and Buckland Rivers still holds the glitter of gold for those lucky enough to find the right spot and willing to try their hand at gold panning or fossicking. Remember your Miner's Rights license before prospecting. The Ovens River is dammed at Porepunkah from around Christmas to Easter to create a long, cool river swimming pool. A lifeguard is on duty in the afternoon most days during summer at the pool in Porepunkah. A children’s paddling pool on the river banks nearby give the whole family a chance to enjoy the water. Take along a barbeque and take advantage of the nearby free BBQ facilities and picnic tables. 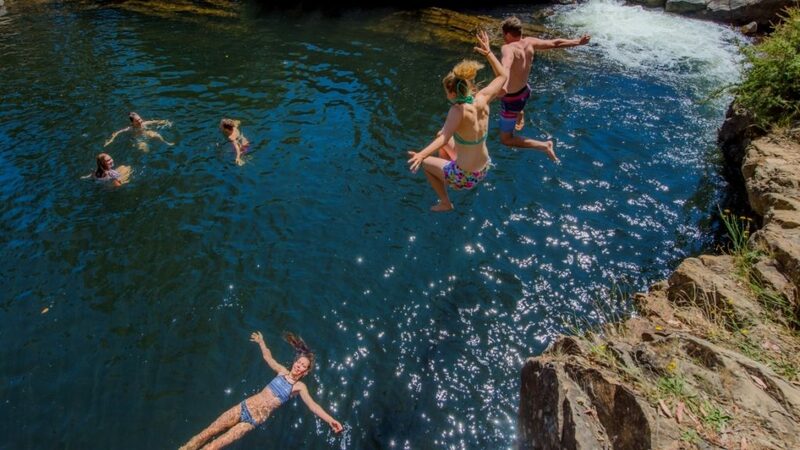 The Ovens River is dammed at Bright from around Christmas to Easter to create a fantastic river swimming pool. A lifeguard is on duty in the afternoon most days during summer at the pool in Centenary Park Bright. The Bright Splash Park is located next to the Bright River Pool and the Rotary waterslide operates in the afternoons during summer. The magnificent Morses Creek is an ideal spot to cool off in the summer months. Grab a chair and sit back and relax while the kids can splash about enjoy the scenery.